휴, 베트남의 남 프엉 리버사이드 빌라 | 호스텔월드에서 예약하세요. 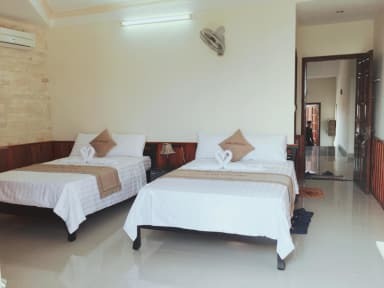 1.2 km from Dong Ba Market, Nam Phuong Riverside Villa is situated in Hue and features air-conditioned rooms. Built in 2013, the property is within 1.4 km of Trang Tien Bridge and a 17-minute walk of Chieu Ung Pagoda. Museum of Royal Antiquities is 1.9 km away. All guest rooms in Nam Phuong Riverside Villa are equipped with a TV. Each room is equipped with a private bathroom and free toiletries, and certain rooms at Nam Phương Riverside Villa have a terrace. All units include a desk. A buffet, Asian or vegetarian breakfast is available every morning at the property. The restaurant at Nam Phương Riverside Villa specializes in Asian and Vietnamese cuisine. Nam Phương Riverside Villa offers a terrace. You can play darts at this 1-star hotel, and bike hire and car hire are available.